Ironically it’s a real challenge in my household to serve vegetarian or vegan meals. I was a vegetarian for several years before meeting my husband and when I started cooking for him it was just easier to eat what he ate. My husband and son are firmly in the must have meat camp so it’s always a pleasure when I can get them to eat a meatless meal without them even noticing. 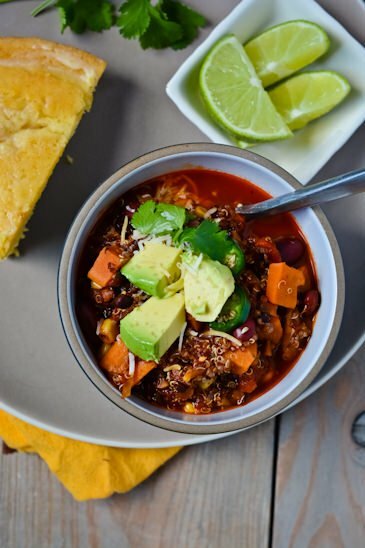 This chili has all the flavors of a classic chili but is loaded with black beans, kidney beans, corn, sweet potatoes and quinoa. 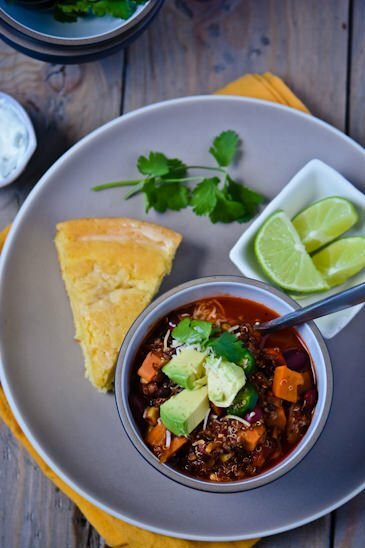 Just like all chili’s the longer you cook it the more the flavors will develop but it can be ready in 30 minutes so it’s a good alternative for a weeknight dinner. You could also easily throw it all into a crockpot after you sauté the onions and garlic and just let it cook all day and have it ready for you as soon as you get home. 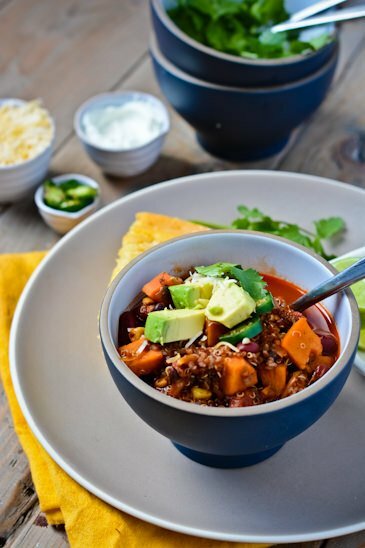 This vegan chili is full of vegetables and gets an added kick of protein from the quinoa. Heat oil in a large pot over medium heat. Add onions, bell peppers, garlic, salt and pepper and cook until onions are soft and translucent, about 10 minutes. Add chili powder, cumin, cocoa powder, honey and chipotle powder if using. Cook for 2 - 3 minutes until the spices are toasted and fragrant. Add the tomatoes, beans, sweet potato and corn and water to the pot. 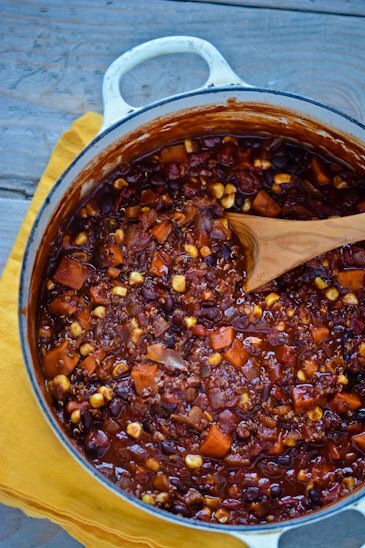 Bring the chili to a boil, reduce the heat to a simmer and cook for about 15 minutes. 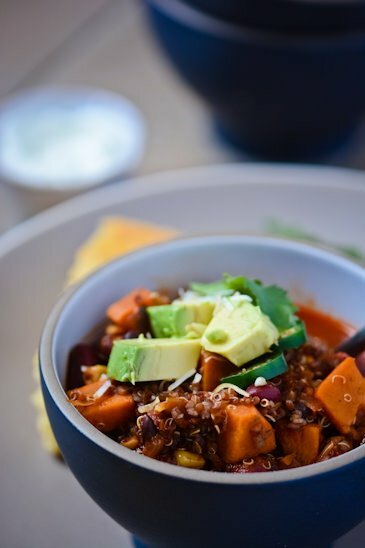 Add the quinoa to the chili and cook for another 10 -15 minutes or until the flavors blend and the chili has thickened. Taste and add more salt or pepper if needed. Serve with the cilantro, sour cream, cheese and jalapeños. Looks delicious! Reminded me of the chili I like to eat at the lodge at MT. Hood Meadows. I’ve been wanting to recreate it, but your recipe sounds even better! I wanted to try and get the boys to eat something without meat so I loaded it up with a lot of vegetables they like. Let me know how it turns out if you try it! Made it last week. Jason and Kai loved it! Thanks for a great recipe. Going to make it again today, but I’m missing a couple ingredients. I think I can make it work! I’m so glad you all liked it. I like the fact that most of the ingredients are things I have hanging out in the fridge and pantry most days so I can always whip it up when I want. The recipe is more of a guideline, I add what I’ve got on hand and mix and match the vegetables and types of beans I”m using. I’ve made this 3 times now! Delicious each time. Just finished the last bit of leftovers for lunch. I like it soupy, so I added extra water and threw in a handful of kale. It was a perfect lunch! I’m so glad that you’ve enjoyed the recipe. We should have a chili night sometime soon with the boys! I’ll make the cornbread! This dish is delicious! I am going to make it again tonight for a friends birthday dinner. I’m so glad you tried the recipe and liked it! It’s one of those things that I threw together one night from stuff laying around and it came out so well that I decided to write a recipe for it. Thanks for checking out the blog! 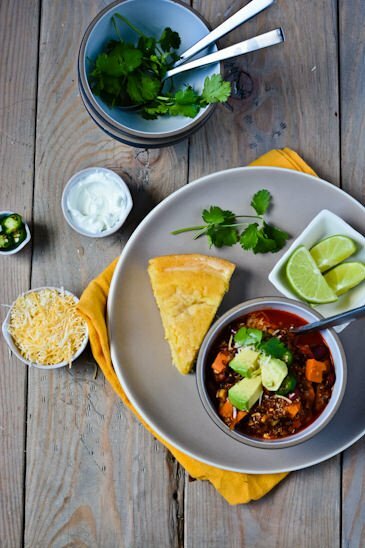 This chili is very good! I’ll be adding it to my list of recipes to make again and again. Thank you! I’m so glad you enjoyed the recipe. 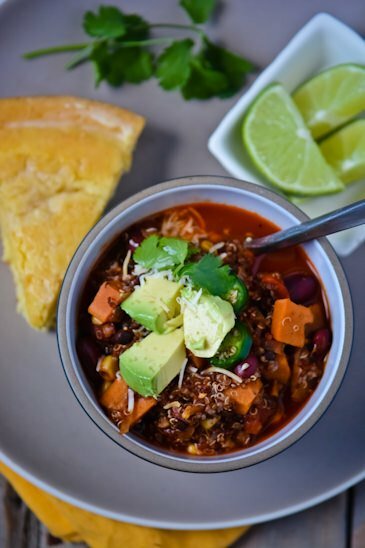 I make all kinds of chili but it’s nice to have one that I know is healthy so we can eat it without any guilt!